I had mentioned making some birdseed ornaments last week. There are a few different recipes for these ornaments. I tried two. Both worked well. But I have to say, they took several days to dry, not the 8 hours or overnight that any of the online recipes said. Maybe it's a Seattle thing, with dampness and all. But as I am hoping to use a couple of these as gifts, time for drying is important. Anyway, the first recipe I tried was for gelatin, water and birdseed, only. I liked this recipe quite a lot, for its ability to hold everything together, and it didn't seize up quickly, so I could take my time making the shapes. The downside was that it seemed to take longer to dry out, than the other recipe I tried. I tweaked the recipe a bit, and have made my suggestions for making these more easily. 1) Pour boiling water into bowl. Sprinkle with gelatin. Stir, stir, stir. 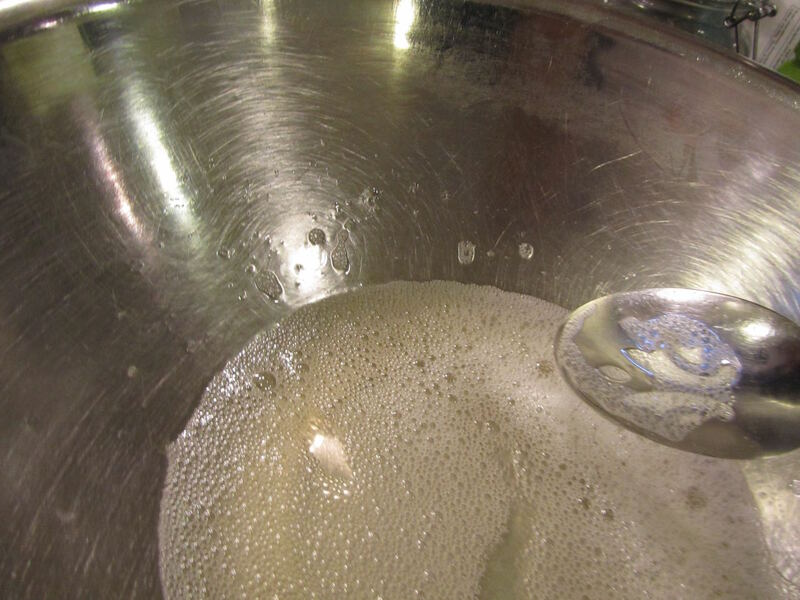 If there are clumps of gelatin in the water, place the bowl over the pot of boiling water, and stir until dissolved completely (takes no more than 5 minutes). 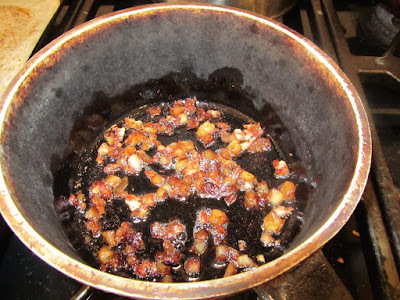 Remove from stove. 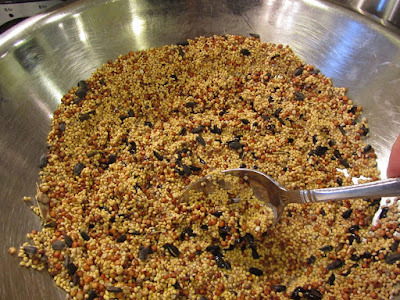 2) Stir in the birdseed, and stir until the gelatin covers all of the birdseed. 3) Spray cooking spray on the inside of the cutters or containers. 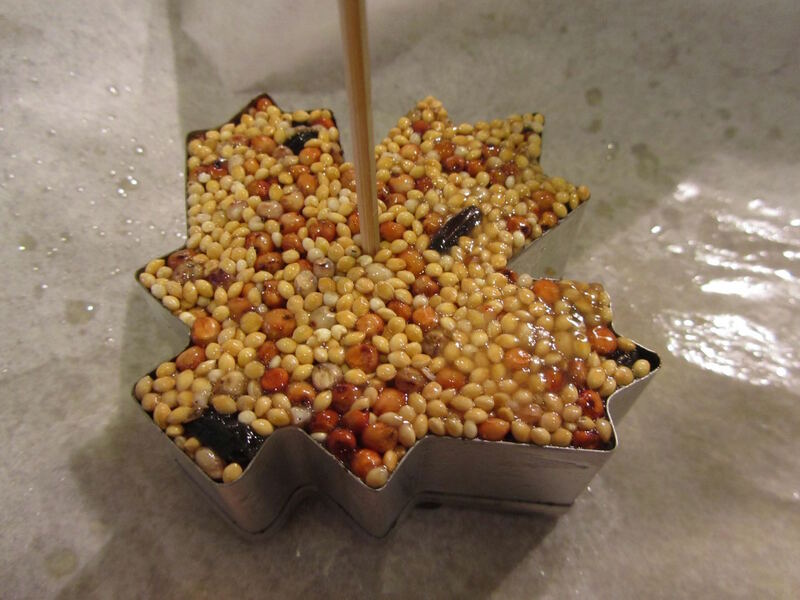 Mound the birdseed in the mold. Pack the birdseed mixture, very compactly into the containers/cutters, using the palm of your hand for large areas, and the underside of a small spoon for tight corners. 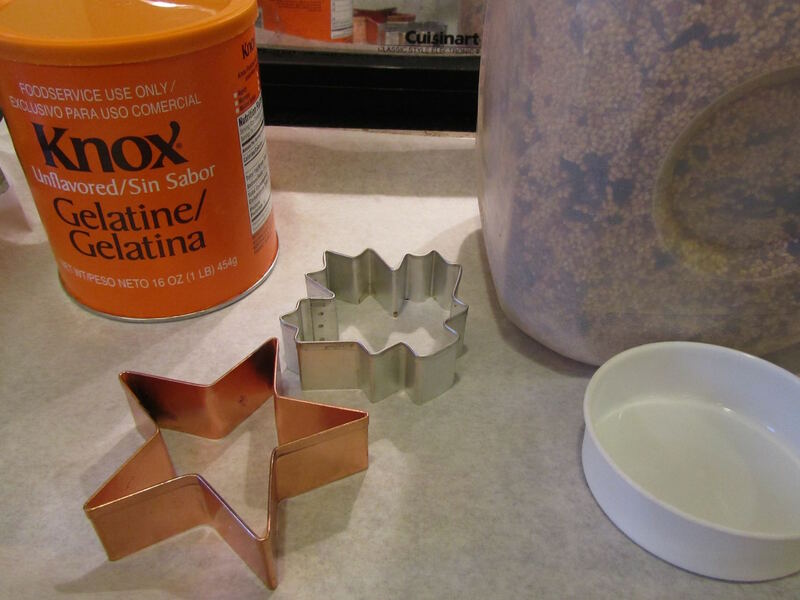 (You can also spray a sheet of waxed paper with cooking spray and use that to help press the birdseed into the molds.) Fill small areas of the mold, using a teaspoon, as needed. Then, pack tightly, again. Packing tightly is key for getting these ornaments to hold together. After about 2 minutes, gently tap the birdseed ornament out of the measuring scoop. 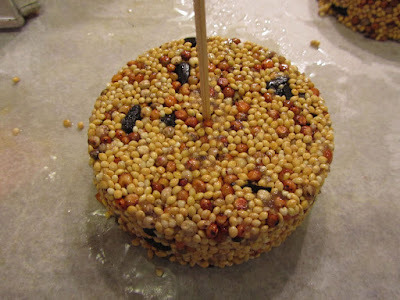 4) Use the skewer to carefully poke a hole in the center of your ornament, all the way through. you'll want to poke the hole in the center, before you un-mold. Before unloading, you'll want to poke your holes, first, while birdseed is still inside the cutter. Use a skewer to poke a hole in each ornament in the center. Then leave the ornaments inside the cutters, for a several hours to firm up. The detail will come out better, if not un-molded right away. 5) Begin the drying process on the sheet of waxed paper or parchment, for the first 24 hours. After 24 hours, carefully move the ornaments to a cake-cooling rack (for air circulation all around). Turn them over, once per day. These will require 5 to 7 days to dry enough to wrap in cellophane or pack in a box. 6) Around day 5, use a yarn needle to thread some twine or thin ribbon through the small hole you initially created. Tie the twine/ribbon together at the top, to form a hanging loop. I added a small bow to the twine, just above the top of the ornament. You could also use a sprig of greenery where I placed the bow. If shipping these, once completely dried, wrap individually in a sheet of plastic wrap, then overwrap in bubble wrap, and then place in a small box. You will want them to slide about, as little as possible, in transit. I saved the star-shaped ornaments for our yard, but am gifting the circular ones, as they feel more durable for shipping. the simpler the shape, the better. Points on the star crumbled a bit when removing from the mold. But the circle held together with much less crumbling. some crumbling is to be expected. Don't assume they are ruined if a few grains of birdseed fall off as you move or turn the ornaments. 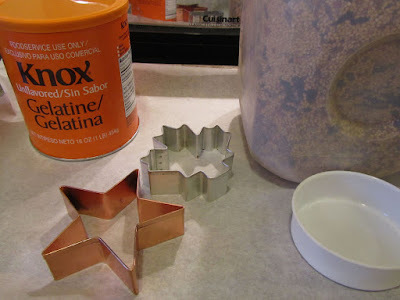 the ornaments that I made with cookie cutters had to remain inside the mold for a day, in order to release them neatly. This meant I couldn't make multiple stars, the way I could make multiple circles. allow to dry for 5-7 days, before wrapping for gifting. After 1 day, I carefully moved my ornaments to a cake rack, for better air circulation. These need to be very dry before wrapping, to prevent mold. I used a yarn needle (the kind used for weaving the ends of yarn into a knitting project or for sewing knitted pieces together) to thread the twine through the dried ornament. A yarn needle would also allow you to thread ribbon, easily, through the small hole of the ornament. leftover bits of birdseed mixture can be placed in tray-style bird feeders, or in scooped out orange or grapefruit shells, and set out for birds to nibble. These retail for about $20 in specialty catalogs for anywhere from 3 to 6 ornaments. 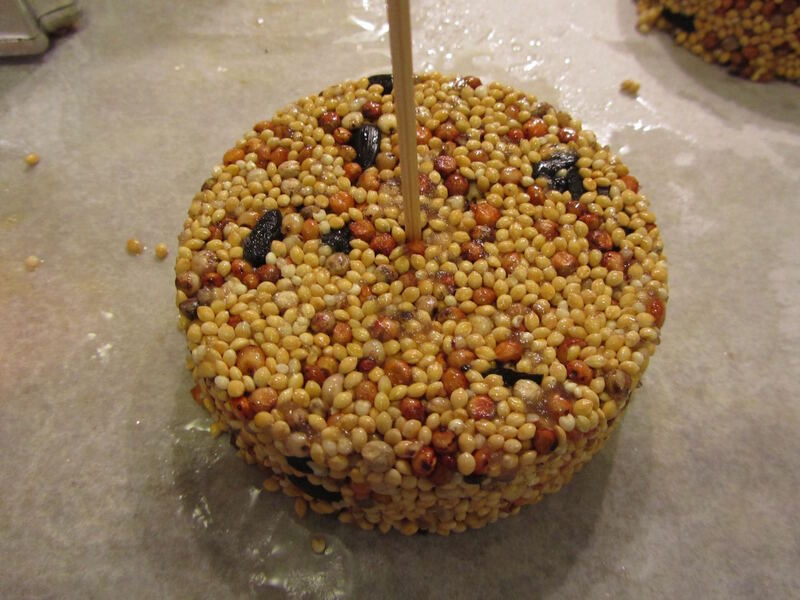 This recipe uses about 1 pound of birdseed, at a cost of 50 cents to $1 per pound, plus about 30 to 75 cents of gelatin (depending on how you buy gelatin), and it makes 4 half-cup ornaments. So, no more than $2 for a set of 4 ornaments. I had all of the ingredients at home for mine, but I estimate that my cost was around $1 for the set of 4. Not a bad savings! Are these safe for birds to eat? Or are they just for inside decoration? These are food for birds. And apparently, they are also food for squirrels in my yard! A couple of thoughts. 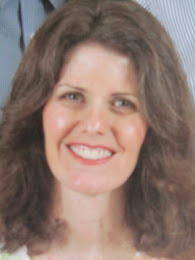 Do you think you could use a dehydrator to help them dry faster? Also, years ago, I used a birdseed combo. like this in a feeder in the middle of one of my flower beds. Some of the dropped seeds sprouted and introduced an invasive grass into the bed that I've not been able to get ride of no matter how much I've tried. So I generally use one ingredient birdseed now, or would only use the mixed kind where I could control and weeds that might come from it by mowing or similar method. With being said, I really like the look of these. I'm gonna have to give this some thought. I thought of the dehydrator, but I was too lazy to get it out. If I make another batch (which is pretty likely), I may try the dehydrator. What a nuisance you must have had with the birdseed grass. I suppose it might be wise to only put birdseed in areas of the yard where either you don't mind some sprouted seeds (in lawn or wildflower areas), or seeds just couldn't do any sprouting (over a deck or paved area). 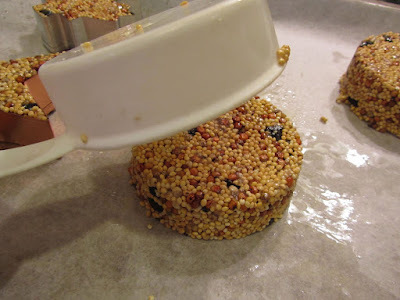 Pressing the mixture into molds by hand does seem to be easiest and most complete with the smaller seeds like millet. But I have seen, for sale, the larger seeded birdseed ornaments. I've always been drawn to their look (just no the price). I've seen them made in the shape of eggs, using plastic Easter eggs for molds. Those are nice-looking, too. Love this idea! I think I will do this as a craft with my kids. Growing up in Ohio, I remember doing some where we dipped a pinecone in Suet, then in birdseed (I think). But pinecones are a rarity here, so this would be much more doable. Thanks for sharing the directions! We did the pinecones smeared with peanut butter, then rolled in birdseed. Messy, but effective. If you make these, have fun! 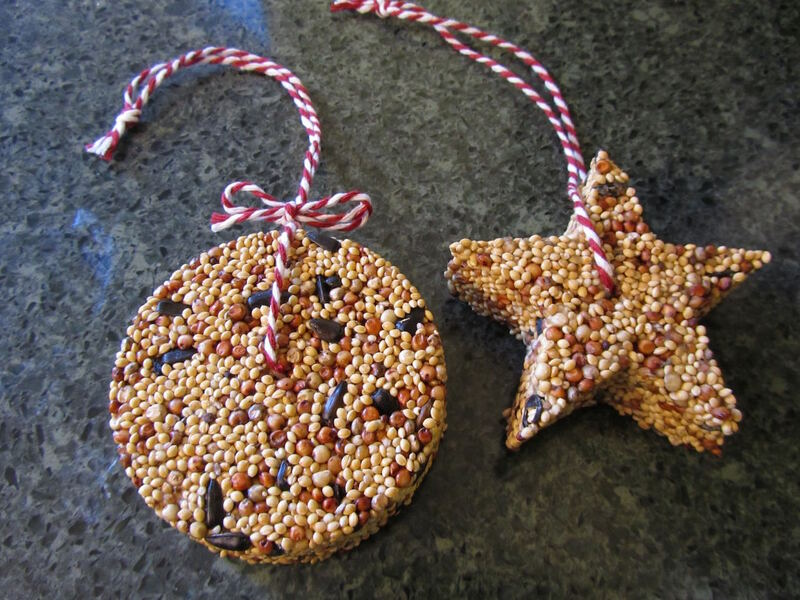 Your birdseed ornaments turned out well! I would like to try these. I already have several projects going for this Christmas, so I'm not sure I'll have time. I printed the instructions though...maybe next year. I know what you mean. I have a long, long list of gifts that I want to make, but just not enough time or people to gift them to. I do think the natural look of these is attractive. these were fun to make. I left some notes at the bottom of today's post (12/8/16) concerning their fragile nature, so be sure to really pack the birdseed into your mold, and then allow to dry thoroughly before wrapping up. This is definitely one project that I will keep working at and tweaking, as I see a lot of gifting potential in them.